Cruises from Sydney depart from fall through spring. Sydney is Australia's showcase city, and its grand harbor never fails to impress arriving cruise ship passengers. 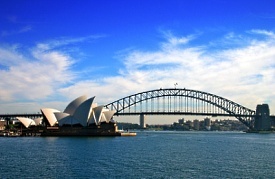 Its most famous attractions are the landmark Opera House and Harbor Bridge. Bondi Beach is a surfer's heaven, and Watson's Bay offers terrific views of Sydney's skyline. View kangaroos, emus and, of course, koalas at Koala Park, or take a stroll through The Rocks, Sydney's oldest neighborhood. The White Bay Cruise Terminal is approximately 11 miles from Sydney's Kingsford International Airport. Travel time between the airport and the pier is approximately 35 minutes. From Sydney Airport -Head north on Airport Drive, and follow directions toward Keith Smith Ave. Turn slight left onto Keith Smith Ave and then continue on to Shiers Ave. Take a slight left onto Sir Reginald Ansett Drive, a right onto Joyce Drive, slight tight onto General Homes Drive, and then a left onto Mill Pond Rd. Continue straight to stay on Mill Pond Rd and then merge onto Cross Drive/Metroad 1 via the ramp to City/Randwick. Exit towards Kings Cross and turn left onto Cross City Tunnel. Keep right at the fork, follow signs for Metroad 4/Anzac Bridge/Western Suburbs and merge onto Western Distributor Freeway/Metroad 4. Continue onto Victoria Rd/A40 (signs for Drummoyne/Ryde/Victoria Road/State Route 40) and turn right on Robert Street, followed by another right to stay on Robert Street. Some sailings will depart from the Overseas Passenger Terminal. The Overseas Passenger Terminal is approximately 11 miles from Sydney's Kingsford International Airport. Travel time between the airport and the pier is approximately 35 minutes. From Sydney Airport – Exit the airport, Head south on Departure Dr. Continue on Cooks River Ave. Turn left to stay on Cooks River Ave. Continue on Marsh St. Turn left to merge onto S Western Motorway. Merge onto General Holmes Dr. Slight left at Eastern Distributor. Continue on Cahill Expy (Partial toll road). Exit onto Bent St. Turn right at Loftus St. Turn left at Alfred St. Turn right at George St. Continue on Oslo Plads. Slight right at Hickson Rd.